Earlier Pay & File Tax Return Deadlines On The Way? The annual self-assessment tax filing deadline is set to be brought forward to a “much earlier” date, according to a report by Brendan Keenan in Monday’s Irish Independent. At present, self-employed individuals, company directors and others must file their annual Form 11 income tax return by 31 October. 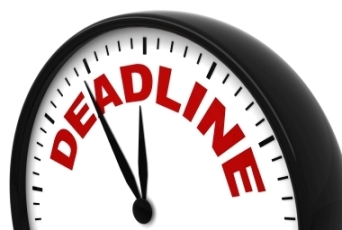 A later deadline of mid-November applies to online returns. Under new Eurozone financial monitoring rules, the Irish government will apparently be obliged to bring forward the annual Budget from December to October each year. Accordingly, the 2014 Budget has been scheduled for 15 October this year. Self-assessment taxpayers will have a further month, until 14 November, to declare and pay their Income Tax liabilities for 2012 and Preliminary Tax payments for 2013. This means the Dept of Finance will be framing the 2014 Budget without knowing the total amount of tax receipts for 2013. In order to prevent this anomaly becoming an annual problem, it is now being suggested that the tax return deadline be moved forward next year. If the tax deadline is brought forward by 7 weeks, in tandem with the change of date for Budget Day, this would suggest a new Pay & File deadline date in early-to-mid September. If the current online filing extension is continued, we can expect the final deadline in late September for online returns. This would represent a major change, both for self-assessment taxpayers and for accounting and book-keeping firms who prepare tax returns for their clients. It takes quite a leap of faith to expect that accounts staff will be happy to work crazy hours preparing tax returns throughout the month of August, when everyone else enjoys their summer holidays. On that basis alone, I would have serious doubts over the feasibility of a September tax deadline. Remember than two years ago, the 2011 Finance Bill included a proposal to bring forward the Pay & File deadline by one month t0 30 September. This quickly attracted controversy and was later quietly dropped. Sadly, with the EU now setting the agenda, its quite likely that the tax authorities will have no wriggle-room this time. your feeds or even I achievement you get entry to consistently rapidly. Juust wish to say your article is as astounding. The clarity in yopur put up is just excellent and that i can suppose you’re an expert on this subject. feed to stay updated with impending post. Thanks a million and please carry on the rewarding work. The Way? | Thomas McGibney & Company Chartered Accountants <Loved it! type of forceful training, while one used a force-free method of training. Also called Alsatians, German Shepherds were bred by Captain Max Von Stephanitz during the 1800’s.